First of all a big thank you to every one who came and supported us at Scarborough over the Easter weekend, especially those of course who bought a magazine and subscribed! The response has been overwhelming with demand exceeding the posting abilities of our distribution department in Weston-super-Mare. Well, there are only two of them down there stuffing the envelopes! ScooterNova meet SLUK, en route to Scarborough. All riders together. For those who missed Scarborough, ScooterNova will be at the BSRA scooter rally in Weston Super Mare in a couple of weekends’ time and we will have a stall there next to the campsite entrance on Saturday. We might even have some merchandise too, which a lot of you have been asking about already. We will also have the ScooterNova ‘street team’ in action again too in the town over the weekend, so look out for one of them wearing an easily identifiable red messenger bag. Once spotted, like you would with the ice cream man, stop them and buy one! Of course if you don’t want to carry this fine new magazine home with you on your scooter for risk of damaging it (a lot told us that at Scarborough), then you can subscribe here and have it posted straight to your door, which is handy! The other way is to support your local scooter dealer. Here at ScooterNova we very much encourage you to do so because it is your local scooter shop that will help you out with last-minute spares for example when a control cable unexpectedly snaps. Yes supermarkets might be on every other street corner and offer free gifts with all of their magazines, but we’ve never found them stocking 3.50×10 tyres when we need one! You will find a list of scooter shop stockists here, and we will be adding to that list as soon as more dealers join in with the ScooterNova. 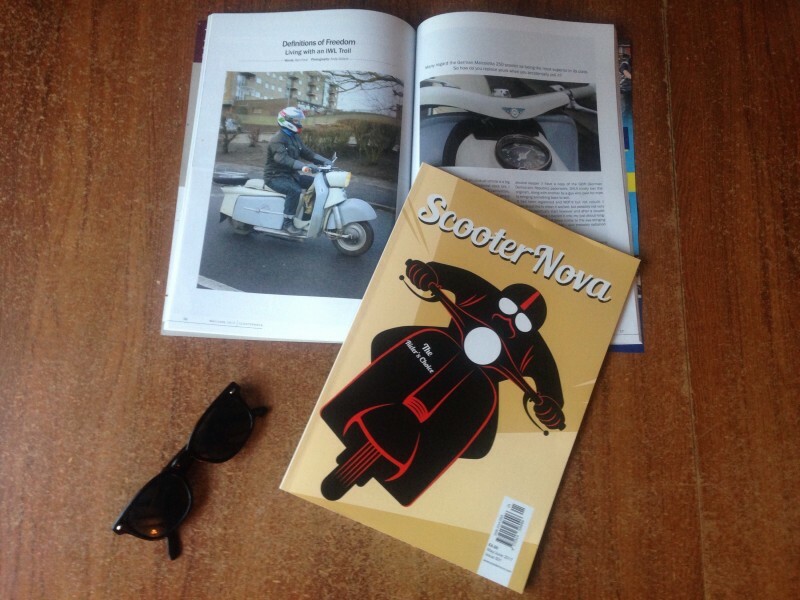 You will also find certain dealers selling the new ScooterNova magazine at rallies, shows and other events, such as Crusader Promotions (rally patches and Ts), along with both the Lambretta Club of GB and Vespa Club of Britain stalls too. Why are all these people supporting us? Because like them, ScooterNova is by scooterists for scooterists. We ride, get wet in bad weather, party and talk scooters with all of you because we are genuine enthusiasts and have been so for longer than we care to remember. That’s what the scooter scene is about. This entry was posted in Lambretta, New Products, Road Trip, Scooter Event, Scooter Rally, Tested Products, Vespa and tagged dealers, how to subscribe, launch party, mag, merchandise, new, quality, Scarborough, scooter magazine, scooternova, stockists, subcribe, subscription., weston-super-mare by admin. Bookmark the permalink.